Revisiting the “Freedom Summer” of 1964. Something difficult to quantify is missing from Playhouse on the Square's thoughtful POTS at the Works production of The Left Hand Singing. It's not good intentions, committed actors, or challenging material. Considering the raft of Jim Crow-style voter I.D. laws enacted in recent years, it's not currency either. The individual pieces of Barbara Lebow's smartly crafted play about life and death in and beyond the civil rights era are all neatly assembled. But like the three distinct female characters left standing when the lights go down, they never completely click. If 1967 was the Summer of Love — and not especially loving if you lived in places like Detroit when Michigan governor George Willard Romney ordered the National Guard to squelch the catastrophic rioting — then perhaps 1964, sometimes called the "Freedom Summer," was America's long, hot season of smoldering hate. JFK's assassination in Dallas was still a fresh national wound in '64, when a thousand mostly young, mostly white, and mostly Northern volunteers descended on Mississippi to organize "Freedom Schools" and register African-American voters. They were bitterly opposed by local authorities, regional media, everyday folks, and the White Knights of the Ku Klux Klan, whose ranks had been invigorated by the threat of another Yankee invasion. Idealism clashed with entrenched Southern identity, and the casualties mounted. Thirty-seven black churches and nearly as many black homes and businesses were torched or bombed. Scores of people were beaten, some were killed, and 1,000 or more went to jail. The Left Hand Singing is really two separate but intertwined plays that measure themselves against each other and also against the unspeakable horror and incredible promise of Mississippi in the summer of '64. 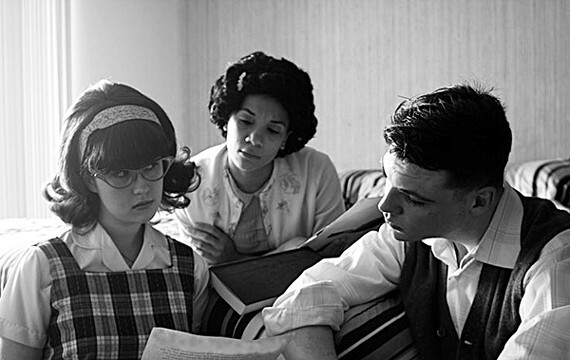 The first play is a youthful snapshot that takes place in a dorm room over the course of an evening in 1964. Three college friends — Wesley, a white Protestant preacher's son; Linda, the only child of a single Jewish mother; and Honey, Linda's clear-eyed African-American roommate — are caught up in an intoxicating swirl of idealism, hormones, and hard medicine as they desperately negotiate a more sustainable future. The second play begins shortly after the first ends, but it adheres to a different set of theatrical unities and unfolds across decades, following the parents of those same three college students, who, we discover early, are doomed to die mysteriously while registering black voters in Mississippi. Lebow is an ambitious craftsman, and The Left Hand Singing wants to be a lot more than just another hyper-emotional civil rights drama. It's also a play about time, life, youth, age, death, privilege, perspective, mental illness, and practical immortality. Director Dave Landis hasn't risen to every challenge, but he has gotten good performances from his actors in a bare-bones production that's long on sincerity and short on style. Karin Barile is endearing as Bea, a progressive parent who responds to her daughter's death by throwing herself into global activism. Claire D. Kolheim ages convincingly to play an Alabama mom who becomes the teacher and community leader her lost daughter couldn't be. Sam Weakley is reliably humane as a progressive minister who lost one son to Korea and another to Mississippi. The students — Ian Goodwin, Leerin Campbell, and Noby Edwards — are all fresh-faced reminders of that magical stage of early adulthood when everything is so clear and we haven't failed enough not to believe we can't change the world singlehandedly. There is a third, much smaller monologue-driven play set loose inside the other two. Lorraine Cotten is chilling and convincing as Weakley's mentally unstable wife, a proud, broken Southern woman whose views are more conservative than her husband's. She sometimes rants hysterically about how much she hates Rose Kennedy's ability to grieve so perfectly in public. And sometimes she has to go away to get her medicine right. It's a comparatively small part that leaves a big impression. What's missing from this production of a powerful but scattershot play with so many moving parts is a focal point.